“Anna and Laura Tirocchi, Italian immigrants from Guarcino, owned a prominent dressmakers shop in the Federal Hill area of Providence, Rhode Island, from 1915 to 1947. The Tirocchi sisters made dresses, blouses, and coats...” (“The Use of “Robes” by American dressmakers: A. & L. Tirocchi, Providence, RI” -Hilary Baker URI ) All pieces were made at the house, employing a crew of female immigrant dressmakers and seamstresses. Like Tirocchi sisters’ story, I've been thinking a lot about immigrant people and their craft work, used as survival, economic self-sufficiency, therapy, skilled labor, messaging and record keeping. While creating this pattern I was thinking about retaining and not losing parts of your past; about not losing memory of stories and skills in hand-work passed through generations; about the muscle memory in sewing that can stay with you through your life if you learned it as a child. Within that swirling of ideas, was also the concept of time and labor, and invisibility; about doing work that is at home and solitary, and also creates networks and friendships with other stitchers and workers. I've been reading about women using memory as a site for resistance. 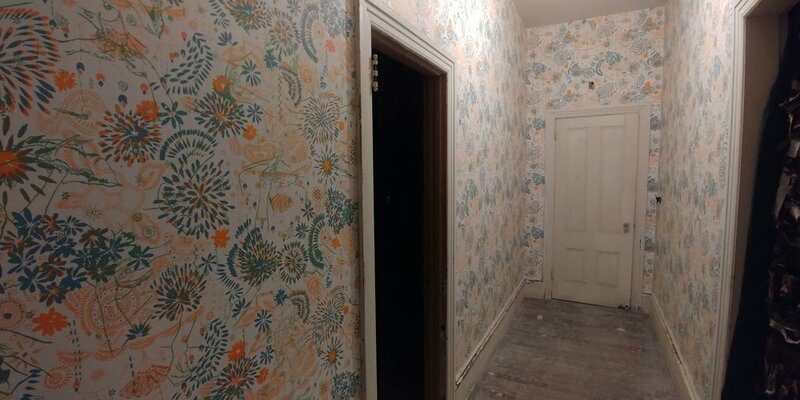 And thinking about the home as a space to restore ones spirit. Details of hand embroidered areas and bead work of the sisters many dresses. Basic hand basting stitches, often hidden on the inside of garments. Art that was inspired by nature, and floral motifs. The many hands that worked on and touched a dress. I have been combining my printing, sewing, and recycling of old textiles to create new pieces. I used dyed projects, old clothes, and printed patterns of things like hair and nail clippings, and herbal plants, to process my thoughts on how the past influences and coexists with the future. In practicing rituals of remembrance holistically, I am also noticing what gets shed and what gets recycled into new stronger shapes and structures. I had been thinking about this in plants too and their systems of communication, change and growth. Western culture often expects change to happen quickly, and I want to remember to not give up when direct action doesn't create immediate results or when the change is slow. Through the process of stitching, I'm seeing the way sewing your own things and sowing seeds are related. This work has helped me to find ways to communicate with my lineage and remember my ancestors. Motif in prints are herbal tea plants. Horchata is a traditional Ecuadorian herbal tea drink -- a diverse blend of herbs and flowers appreciated for its therapeutic properties. Join us in celebrating an iconic chilly season garment, THE SWEATER. This is a collection of works inspired by THE SWEATER, imagined+realized via textile, painting, poetry, and more! Print up in City Arts group show "Feeding Her Fire"
WARP Performance August 4th at 159 Sutton Street Gallery. 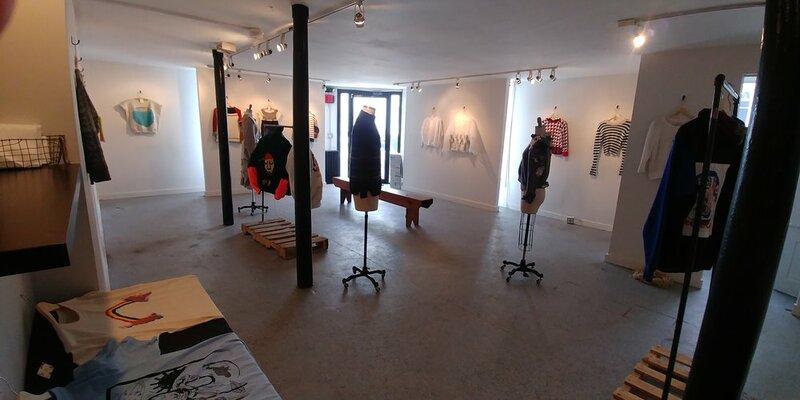 WARP collective textile and print based studio is located in Atlantic Mills in Olneyville RI. "Friends and neighbors will say, What happened to that Esperanza? Where did she go with all those books and paper? Why did she march so far away? They will not know I have gone away to come back. For the ones I left behind. For the ones who cannot out." We are 6 persistent artists, whose shared experiences brought us together to curate our own group show. 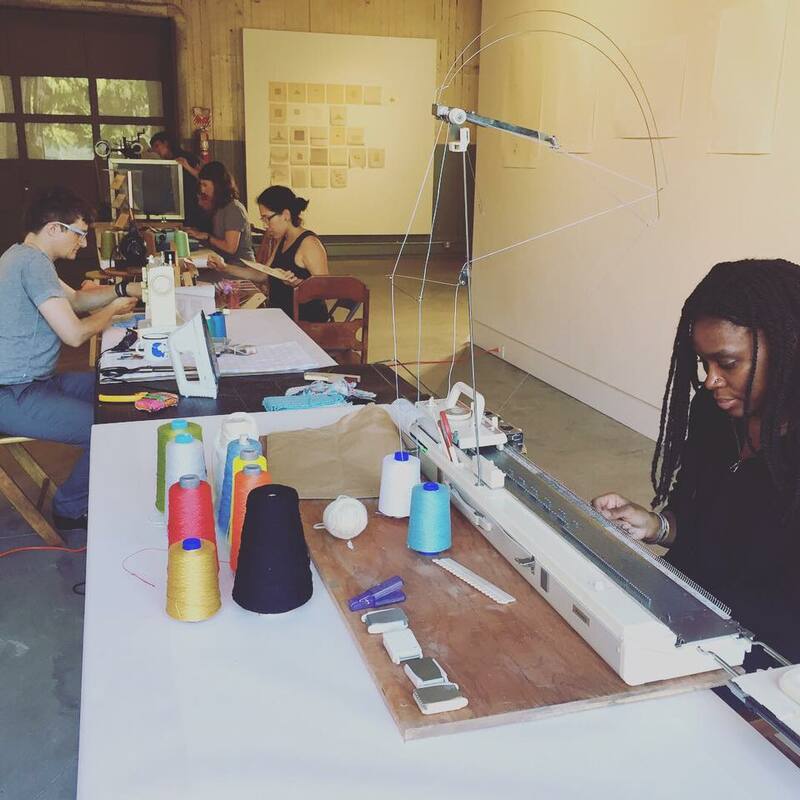 Through weaving, sewing, knitting, and other forms of manipulating textiles our work explores themes ranging from personal narratives to body navigation and memory. Growing up in Providence, navigating higher education systems, and engaging with dominant and white washed art scenes has left us feeling used, underrepresented and tokenized. It is important that we create our own spaces to support and care for each other as friends and contemporaries. We are here, holding nothing down, but trying simply to hold it together. We would like you all to come and experience the work with us. Thank you AS220 print shop!